Enjoy the Islamic Architecture typical for the western Xuanwu District and the area around Ox Street. laned street hidden in Green. 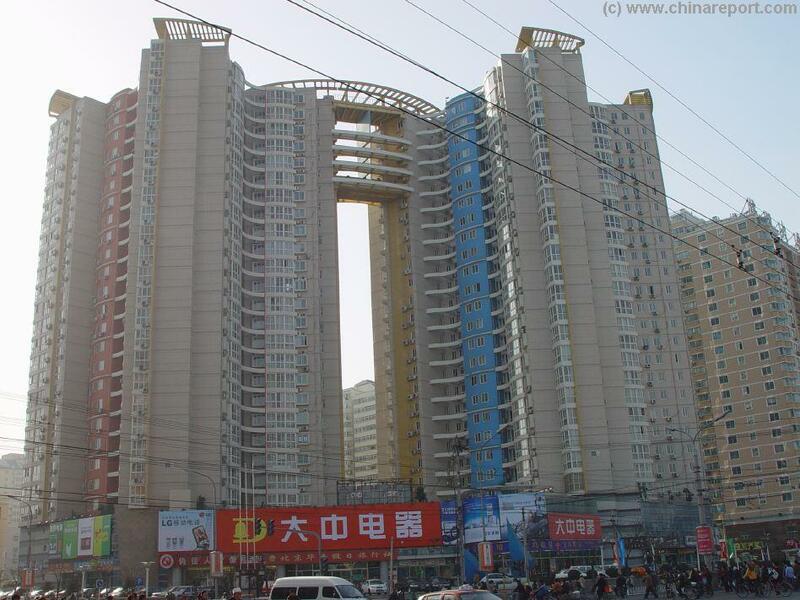 A Taste of Future of Xuanwu District and other Parts of Beijing - large apartment towers in long rows. This particular Building at Guang'AnMen Nei Dajie is one of the better architectural achievements. 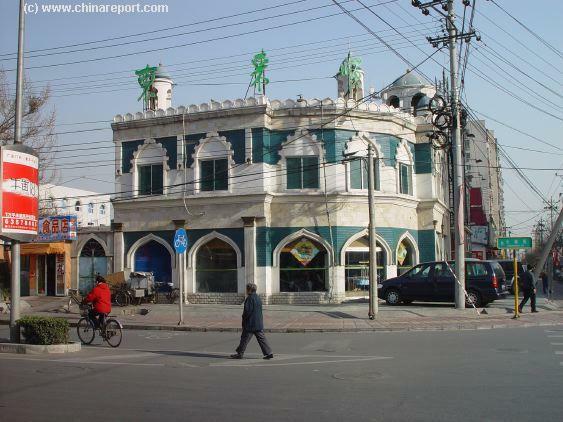 Welcome to China Report's first Digital Report on the Niu Jie Mosque. 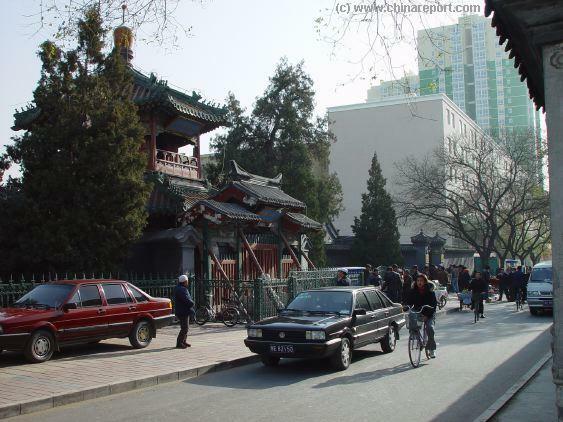 Located on Ox Street, currently a major north-south boulevard in the North-Western parts of Xuanwu District of Beijing, the location of the Mosque is quite easy to find. 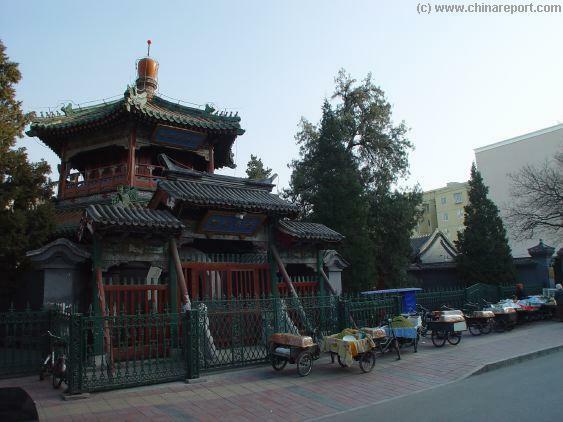 The Niu Jie' Mosque , well hidden in this Beijing suburb is the Biggest Mosque in Beijing, and is the Main Place of Worship for some 180.000 'ethnic' "Hui" , an Islamic Minority , and of course all other Muslims of Beijing. 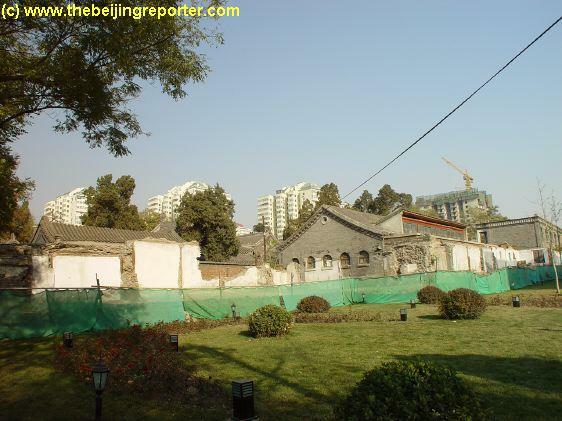 In this respect the the Niu Jie' Mosque can be compared with the South Cathedral at XuanwuMen XiDajie', which is the Centre of Catholic Worship (under chinese government guide / control) in Beijing. 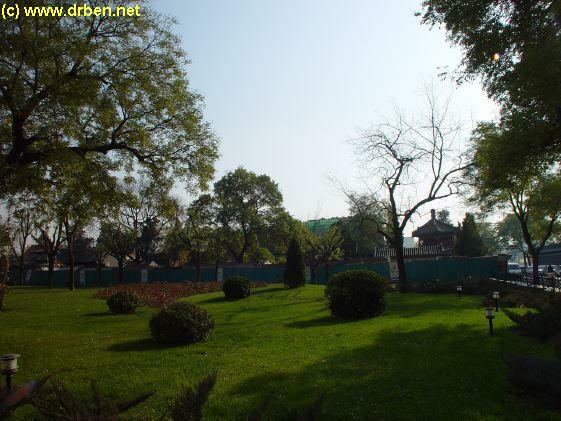 Both sites are directly connected to the rich imperial history of Beijing through the rich scientific knowledge of the Priests, who traveled from afar to win the favor of the Ming Dynasty Court. 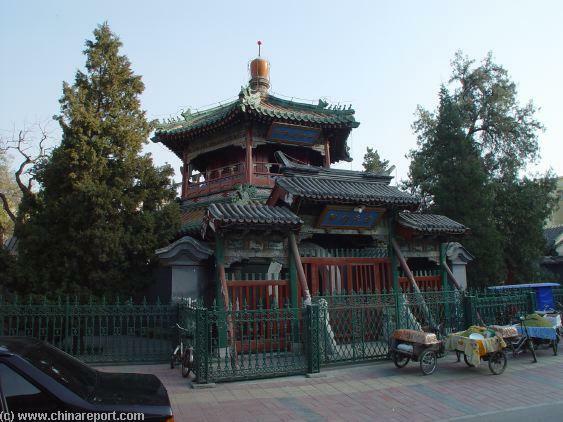 The Niu Jie' Mosque itself has a rich History dating back to the Tenth Century AD, when , it was founded by Muslim wise-men who had traveled down to the important City of Beijing along the Silk Road. Eversince it is the Main Islamic Mosque in the City and, as such, the Burial Place of several important Hui Clergy. Other Temple Treasures, gathered during the 10 centuries include the Hall of Observing the Moon, where in more ancient times the Lunar Calendar was kept. 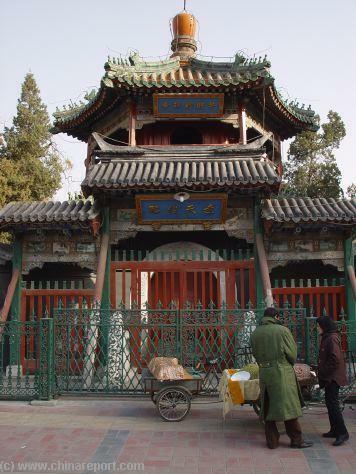 A group of eager culture-tourists flocking past the Ceremonial Main Gate with Moon-gazing Tower (Wang Yue' Lou), unique to this Mosque. a day a center of community activity, including trade. View of Niu Jie Mosque from across the wide-Niu Jie, tradition-ally an important street in the Xuanwu District. Overview of the Unique Front Gate and Tower of Ox Street Mosque. building on the corner of Guang'An Men Dajie' and Chang Chun Jie' (Everlasting Spring Street), the latter leading North away from the Ox Street Mosque. From here correct directions are simply South across the boulevard down to the Entrance Gate of Niu Jie Mosque. to the function of Mosque. Due to the special Feng Shui overriding requirements of the Muslim Faith, the Main Ceremonial Gate of the Mosque was constructed not at the South end, but at the very West of the complex, allowing for Muslims to pray to Mekka, the muslim holy city located due West as seen from China. is at hand to claim your attention. you manage to get away somehow. Needless to say this can be quite bothering and can interfere with your enjoying the Main Gate of the Mosque. If possible, have a good look. The original islamic features of the 10Th century mosque have been lost in reconstructions over the last 1000 years, but the moon-gazing tower is still there. 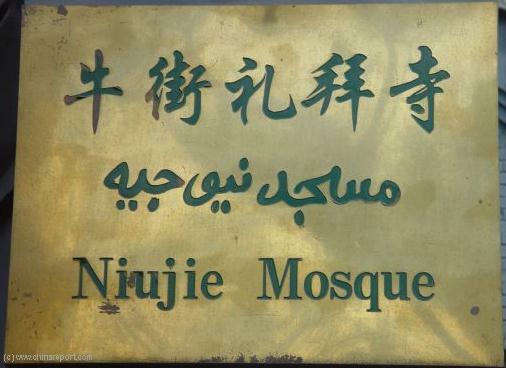 Niu Jie Mosque Name Plate. Using the higher up platform of the moon-gazing tower the early founders and successive Mullah's could gaze out over the low structures of the Hutong to watch the night sky and make astronomical observations related to Faith and Science. The waxing and waning of the Moon, dictating dates for the holy days and festivals of the Islamic Faith was especially important. Today the surrounding buildings and usual smog would block such a view, but the tower remains an attractive sight. Traditional Dancers from a Muslim Minority during a Fair in Ox Street. Hutong. Get your taste while enjoying the scene and athmosphere at the Mosque Gate. 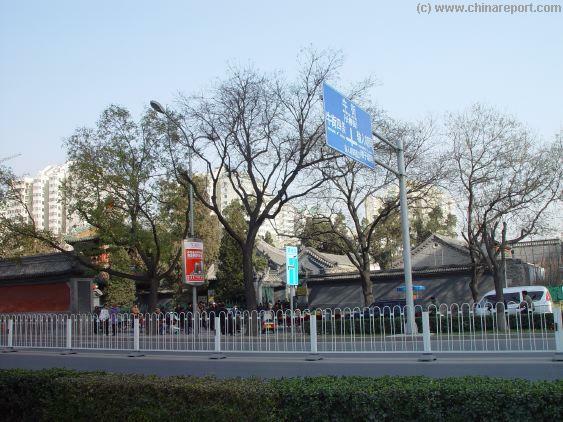 As an important boulevard, Niu Jie is usually busy. Bicycles move in hordes past the Mosque Gate during rush hours. Some caution is necessary. Otherwise, the Gate seems a bit of a secluded spot away from the worst car traffic and noise, due to the decorated Screen Wall seperating the road from the Mosque and its Gate. 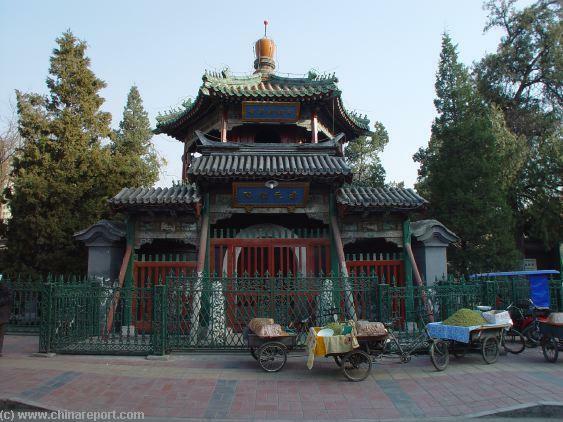 The surrounding area, along Guang'An Men Boulevard, Everlasting Spring Street and around Ox Street and its ancient mosque is home to the largest community for ethnic minorities in Beijing. Formerly known as LiuHe Village, the area has no less than 28 ethnic nationalities including Han, Hui, Manchu, Korean, Mongol and Uygur. 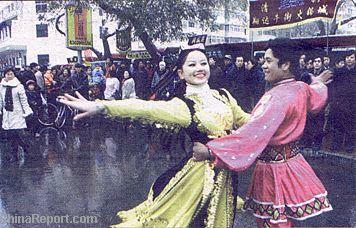 Among its 54,000 total population, the Hui (islamic) nationality takes up some 12,000, or 23 percent. As may have been expected in the current Xuanwu District, people of different nationalities and cultural backgrounds live harmoniously among eachother, celebrating Festivals regularly. Don't miss out on the Fast-Breaking Festival, the highpoint of the year when muslim artists and faithful descend on the area to dance, eat and enjoy. The fast-breaking festival is a delightful event attracting visitors from all over the world. reported a clan of white-capped people worshipping a rebellious chief named Mu as their true God rather than the Kangxi Emperor, their overlord. Supposedly they were seen gathering in a place at Niu Jie, where non-white capped people were not allowed and had declared to fight to the death against the Ching Dynasty if they were not allowed to go about their own business. This was open rebellion ! Although the story seems somewhat unbelievable since the muslims had been in this area of the city at least since the days of the Yuan Dynasty (1271 AD - 1368 AD) and Kangxi had personally led the Military Campaigns to re-subdue the Muslim Tribes of the West, it is said that the Kangxi Emperor visited by himself to investigate and conduct a plain-clothes undercover operation to find out more about the alledged plot. (Ps- This Legend may have originated as a Court concocted Propaganda Story helped into the World in order to "Win the Hearts and Minds" of the Hui in the aftermath of the Chinese Invasions of Ningxia and Xinjiang Tribal Lands). 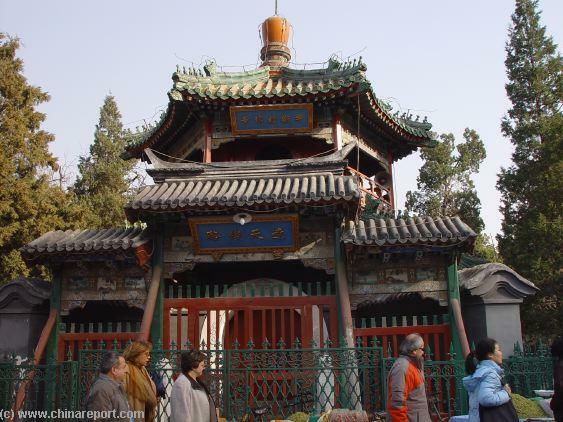 Although small in size, hidden in location and not on most tour programs,Dong Si, as one of the 11 Remaining historic Mosques in China, is one of Beijing's and China's number One Islamic Monuments ! Go to small Dong Si, Eastern Temple or read our small introduction of a modest little corner of the DongCheng District. Dong Si is the Headquarters of the Beijing Islamic association and heart of the Dongcheng Muslim Community.